At Delicious we love the excitement of creating Global Cuisine as you like it. One of our greatest pleasures (and sometimes challenges) is making sure we personalize each menu for every event. This often includes developing new recipes or honoring family traditions for a cross cultural client base. 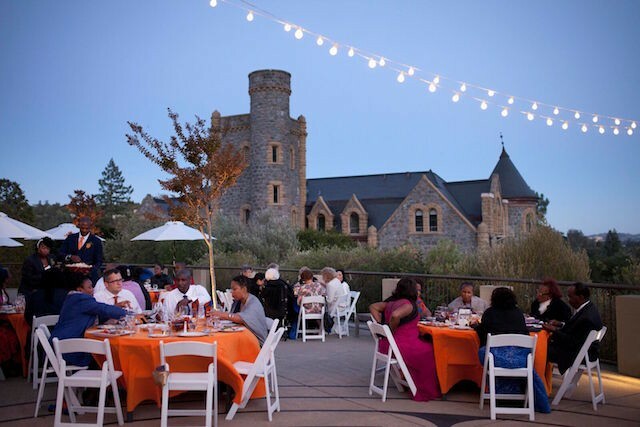 A great example of this is when we had the honor of catering Ana and Jean-Cleaude’s African themed wedding at Geneva Terrace in San Anselmo. The menu included: Small Spoons with Black Eyed Pea Salad, Domoda (Gambian Beef Stew), African Style Tilapia, Garlicky Greens, and Roasted Vegetables. It was a beautiful celebration. We were successful in adding a Delicious! touch to traditional foods. You can see photos and learn more about this celebration at http://munaluchibridal.com/ana-jean-claudes-beautiful-pan-african-themed-wedding-california/. Each of our clients has their own vision and hope of what will make their event special. We strive to accomplish making those special moments happen. Please consider us whether you want an All American Barbeque, A Russian-Chinese cross cultural menu, a classic Matzo Ball Soup, a Mediterranean Cuisine Buffet or something new for your next event.